Silver Coins offer a lower entry point into the world of coin collecting than their Gold counterparts but this is not due to any lesser quality. Silver Coins are typically produced for both the collector and investor markets and feature a range of designs and themes allowing you to build an interesting collection from mints around the world. Some designs even feature additional colour accenting on the face or obverse to further add to the aesthetic quality and collectability. 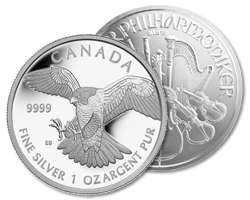 Check out our range of Silver Coins from Mints around the world and begin your collection here. Remember we also stock a range of accessories to properly store and display your collection.